I’m not one to live in the past, but when the phone rang outside an ice-cream parlor at the University of Oregon, I immediately slipped into college mode. I ran to the booth and picked up the receiver. “Hey baby,” said a deep, breathless voice on the other end, “are you a player?” Before I could answer, I heard giggling and the line went dead. This is the college my son has picked, and I think it will suit me just fine. Eugene doesn’t just remember the ’60s, it celebrates them. In fact, the classic college comedy “Animal House” was filmed on this campus. It’s clear students still have time for a prank or two. My family’s first visit to Eugene, last week, was a series of contrasts. I’d heard about hippies in Oregon, but didn’t realize there were so many. A barber in this town might go broke. On the other hand, anyone who sells incense and Indian wall tapestries can make a decent living. A funky shop across from our New Oregon Motel was packed with young people buying everything from love beads to lava lamps. Peace symbols decorate dorm rooms, and record players are in again here. My friend’s daughter is a junior and her vinyl collection includes the Beatles and Pink Floyd. But when it comes to sports … the ’60s are history. The University of Oregon competes at the highest level, thanks to a partnership with alumnus Phil Knight, a co-founder of Nike. Knight has poured millions into the school’s track and football programs and the athletes have, arguably, the best looking uniforms in the NCAA today. Of course, anything with a Duck on it is bound to make a splash. Ultimately, this is why we’re here. My son hopes to play football for the Ducks next year. Even the walk to the stadium is impressive. It’s a tree-studded bike and foot trail that traverses through meadows and over a bridge that crosses the picturesque Willamette River. 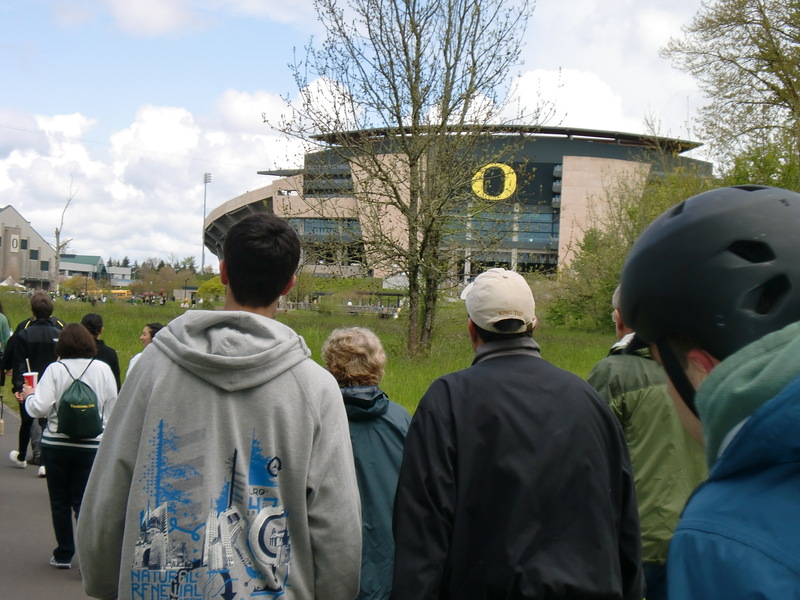 The walk is about 20 minutes from campus, and you emerge from the woods with a sudden and stunning view of the big yellow “O” on the outside of Autzen Stadium. U of O's "Glass Cube"
Like many college towns, Eugene offers much in the way of art and architecture. 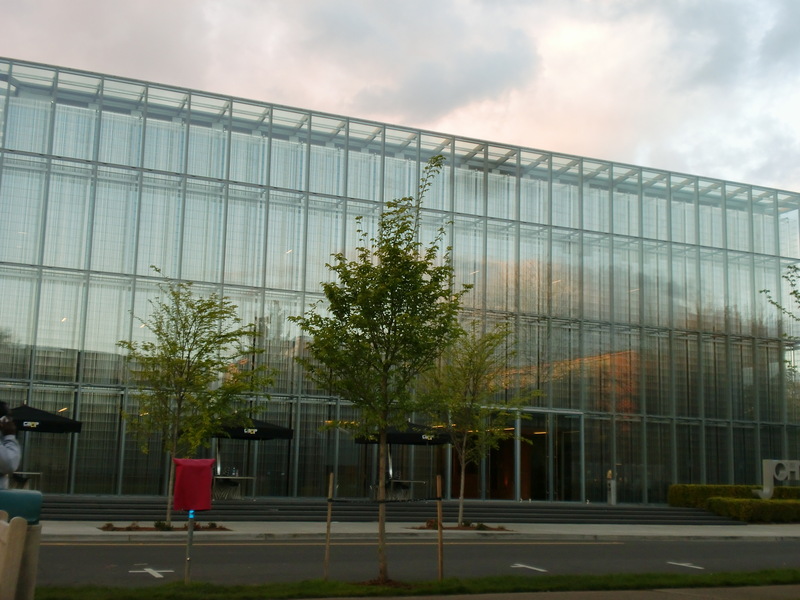 Two of the state’s best museums are on campus, including the Jordan Schnitzer Museum of Art. U of O’s architecture is a contrast of stately brick buildings from the 1870s and ultra modern facilities like the “glass cube” — a $42 million opulent athletic center built by — you guessed it — Phil Knight. And the night life starts well before dark at pubs like McMenamins, where there’s free pool before 5 p.m. and $4 burgers and $2 Cajun tator tots during happy hour. OK, I admit it. We zeroed in on McMenamins within hours of arriving in Eugene. My son took a tour of the campus, and my husband and I shot pool and had a brewski. 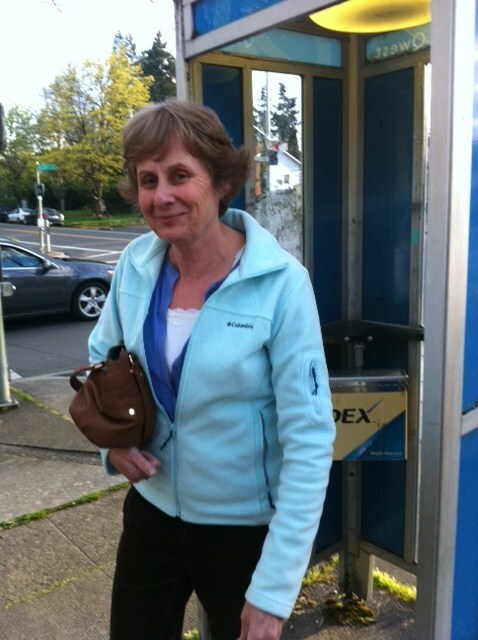 And when we went outside and that phone booth started to jingle, it was like déjà vu all over again. I was back in college and someone was pulling a telephone prank. I just wish I’d thought of a snappy answer before those kids hung up.